Physics Buzz: The Manhattan Project's Fatal "Demon Core"
The Manhattan Project's Fatal "Demon Core"
Sixty six years ago today, Louis Slotin saw a flash of blue light in the depths of Los Alamos National Laboratory. Seconds before, all that separated the young scientist from a lethal dose of radiation was a thin screwdriver. The screwdriver supported a reflective covering that encased a sphere of plutonium, and if the reflector fell into place, a nuclear chain reaction would commence. When Slotin's hand slipped, a lethal burst of radiation hit him, and he died nine days later. One year later, the U.S. military detonated this plutonium "demon core" at the Bikini Atoll in the Pacific Ocean. But the legacy of the demon core -- and its victims -- has endured. 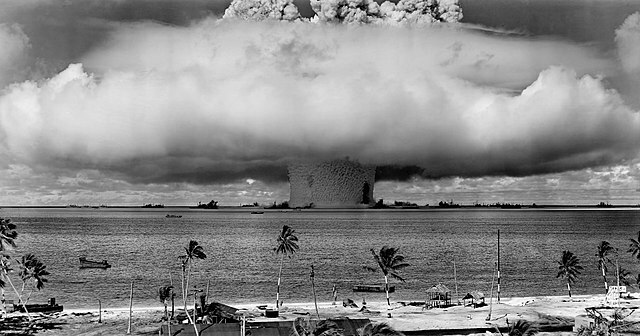 The underwater "Baker" explosion (not the demon core) at Bikini Atoll in July of 1946. Slotin was not the demon core's first victim before it was detonated in the Pacific. Harry K. Daghlian Jr., another Los Alamos scientist, died after a strikingly similar accident in 1945. Alone in the laboratory, Daghlian was conducting an experiment on the plutonium sphere. By itself, the sphere did not have enough mass to start a nuclear chain reaction. With some help from a reflective material, however, the plutonium could start such a chain reaction. During a chain reaction, the nuclei of radioactive atoms split, releasing neutrons. These neutrons join other atoms; these new atomic nuclei begin splitting; and more neutrons are released. By adding a reflective material that sends these neutrons back toward the atomic nuclei, scientists could initiate a chain reaction with smaller amounts of plutonium. Daghlian was conducting tests on this phenomenon when he accidentally dropped too much reflective material onto the plutonium, leading to a burst of radiation that ultimately killed him 30 days later. One year after this accident, Slotin conducted a very similar experiment, but he had an audience. 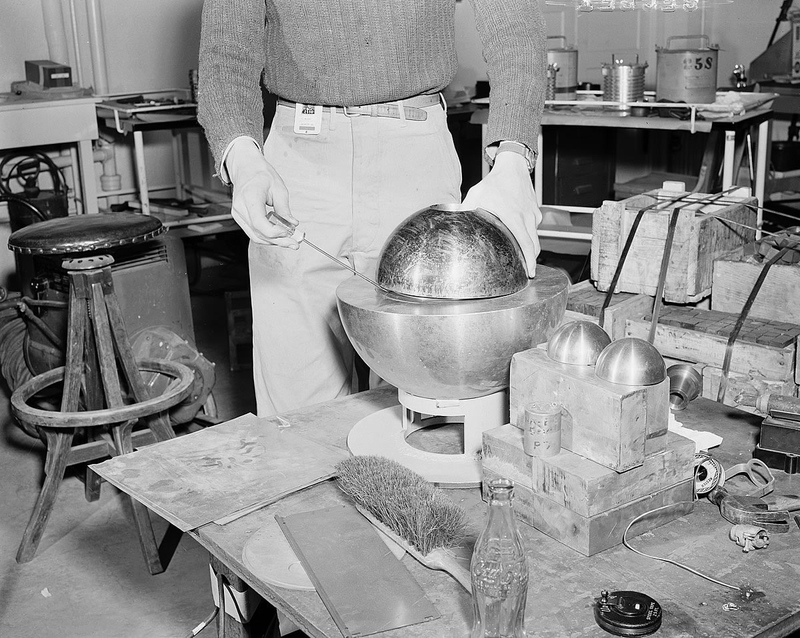 Slotin was showing his work to several other scientists in the room while holding a hemisphere reflective material over the top of the demon core. When the screwdriver that supported the reflector slipped, a huge burst of radiation was emitted. A re-creation of Slotin's experiment. He held the reflecting hemisphere with a screwdriver, as seen above. Image Credit: DOE. After both of these incidents, Los Alamos forbade all related hands-on testing, and researchers used a remote facility to control the experiments. These early experiments highlighted the slim margins for safety in nuclear physics. While these experiments, nuclear reactors at power plants, and nuclear weapons all rely on similar physics, there are key differences to remember. Operators can control nuclear reactions in power plants because of a phenomenon known as delayed criticality. Delayed criticality relies on not only the neutrons that are emitted during atom splitting but also the neutrons that are later emitted by the decaying fission products -- the leftover atoms. These neutrons are released more slowly, allowing nuclear reactors to continue the chain reaction in a controlled manner. When detonating a weapon, however, uncontrolled reactions are optimal. Bomb makers can combine more nuclear material so that the delayed neutrons don't affect the chain reaction. With enough material under the right conditions, an explosion will occur. But that wasn't the case in the two Los Alamos accidents. After dropping the screwdriver, Slotin separated the radioactive materials, and he has been credited with saving the other people in the room. Although they all were exposed to radiation, no one died of radiation poisoning except for Slotin. The conditions for the two accidents were unsafe enough to emit radiation, but there weren't enough ingredients to blow up the building. Slotin and Daghlian have been remembered as national heroes by many and reckless experimenters by others. Regardless, the experiments at Los Alamos certainly guided future research into safer ways to harness the power of nuclear energy. Slotin's story even inspired a fictionalized play titled "Louis Slotin Sanata." To learn more about these experiments, you can take a look at this article (PDF) from Los Alamos National Laboratory. Thought you might be interested in a website that has been historically documenting atomic testing and cancers, etc. Demon core? Actually the scientists in question referred to it as "tickling the dragon's tail." Scientists on trial in Italy . . . again. Is Philosophy Relevant to Physics?